The Edge is perhaps the most easy to ride board from the 2015 Liquid Force twin tip range. It is especially engineered for the entry level rider who wants to have fun and progress fast. The Edge is fun to ride in most conditions you can encounter and gives you the confidence to take your ride to the next level. 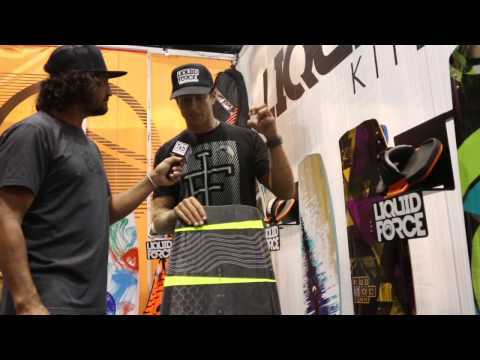 Anyone can discover the beauty of kiteboarding and progress using the Edge by Liquid Force. This board is easy to handle, comfortable and predictable. It is a freeride machine with nice freestyle potential. It is perfect for cruising, boosting airs or progression. The Edge is built for rapid progression, so it is easy to handle and comfortable, but packs the power it needs to keep up with you. The asymmetrical bottom contours ensure a clean and smooth glide plus a lively feel. The board features a turned-up toeside to minimize edge catch. The long single concave bottom shape ensures stability and a very smooth drive even in chop. The sharp heelside edge provides effortless heelside bite. The Liquid Force Edge is crafted using a PU-injected core, two full layers of biax glass for torsional strength and rigidity, Biax longitudinal reinforcement strips for ultra durability and flex integrity and a Sublimated top sheet. This structure is light and durable and makes the board very responsive.